We rarely go more than a month without spending at least one night in the hospital. Some are routine: for observation or testing, others are more emergent and stressful. Regardless of the reason, though, after awhile you get to know everyone - and I mean everyone. The car valet guys, the folks at Au Bon Pain, the desk clerks outside the floor. Then, of course, there are the nurses, residents, attendings, EEG techs, child life specialists, pharmacists, nutritionists, social workers… you get the point. They already know everything about Adelaide so we get to chat about mundane life things which, amidst the beeps of medical machines, is kinda nice. The fact that these people see me without make-up, hair a mess and no bra on when they wake us up at 6am for a blood draw also progresses the relationship rather quickly. It really is so strange waking up to half a dozen doctors or medical students inches away examining your child prior to rounds. Modesty? Here? Nope, sorry, no modesty allowed. But, you get used to it and now I just wake up hoping that I remembered to hide my wine bottle so that they aren’t judging me. There MUST be an exit strategy: my first question upon being admitted is what needs to happen for us to be discharged. Cart before the horse? Perhaps, but with a medically complicated kid like Adelaide, they could justify keeping her there indefinitely if they wanted. Streamline your communication: Adelaide is on a bajillion meds and it can take forever to go through the med reconciliation with the nurse, then the resident and then the pharmacist (seriously, don’t they all share the same computer system?). So, I have a paper that lists all of Adelaide’s meds, dosages and the times they are given in her emergency bag so that I don’t have to verbally go over them each time. Make space for freebies: The hospital and our durable medical equipment provider have MUCH different ideas regarding the amount of supplies required to take care of a patient. The hospital uses ONE syringe per med ONE time to deliver meds and then they are thrown away, meanwhile our DME sends us ONE 10ml syringe per month to deliver all of Adelaide’s bajillion meds. You better believe I’m leaving the hospital with a bag of those syringes! …and the open bag of diapers, wipes, pee pads, pill crusher, thermometer, bottles and everything else they would otherwise throw away once we leave. The small stuff makes a big difference: I request PT and/or OT visits on day one so they can add Adelaide to the schedule if she is able. I also try and see if any of Adelaide’s other specialists are around, can they stop by and chat maybe avoiding a future appointment? Are there any other tests that can be done during this admission preventing a return trip? Maybe more importantly, I take advantage of having 24/7 nursing care and sleep whenever Adelaide is sleeping: there are so many interruptions throughout the night that naps are a necessity (huh, maybe that’s where all the time goes?…). Because Adelaide is immobile and cognitively a newborn, hospital stays don’t pose a major lifestyle change for her, (even so, she does brighten up when we get home). But for our mobile and cognitively able friends that’s not the case. 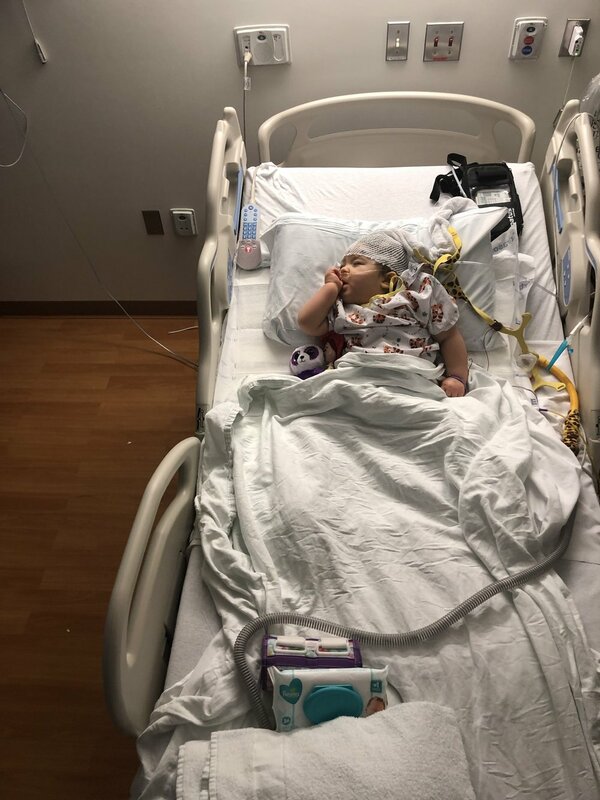 My heart goes out to all the parents that have to entertain their children who are bound to a hospital bed or connected via wires to a wall. That additional stress could outweigh any of the positive relationships, extra supplies, or world detachment. 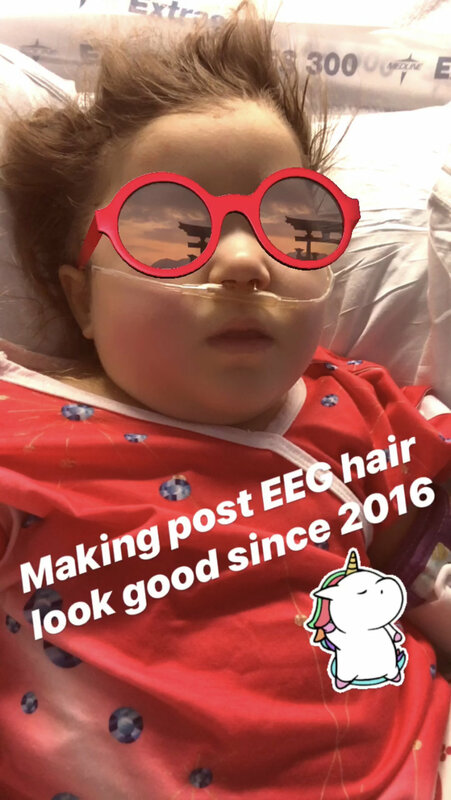 I wish more than anything that Adelaide could connect with her surroundings like she used to, but perhaps when we’re in the hospital it’s not so bad that she can’t. Would I rather never see the inside of a hospital again? Of course. Does even one overnight stay complicate life? Obviously. The truth is, I could write three blog posts worth of content about why I despise being at the hospital not least of which is being away from Jackson. But its not all bad and I think thats a testament to the folks who work there, especially the nurses. So, a special thanks to them, even if I hope I never have to see them again.